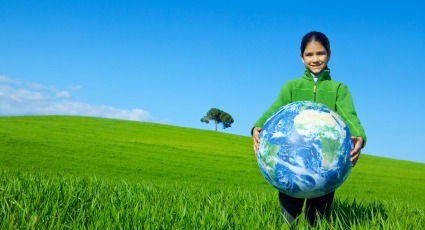 Celebrated in more than 193 countries, Earth Day serves as a reminder that we must continue to protect the planet. Since Earth Day’s founding in 1970, Congress has passed laws limiting carbon emissions from factories and vehicles, and has banned chemicals that have since been found to be harmful to the environment. All of these efforts have helped prevent irreversible damage to our planet, but there are still a number of steps that you can take at home to reduce your carbon footprint. While the United States generates roughly 14% of our electricity from renewable sources, the majority of our energy comes from carbon producing fossil fuels. But, there’s good news! The United States has been working diligently to modernize our electrical grid to help you reduce your electrical usage at home. The Smart Grid allows you to incorporate a variety of new products and services into your home, helping you save energy and money. Here are 3 Easy Earth Day Home Upgrades to help you celebrate on April 22nd. For most homes, the heating, ventilation, and air-conditioning system (HVAC) is the largest user of electricity. Understanding how factors such as weather influence your HVAC usage habits can help you dramatically reduce your electrical consumption. Companies such as WeatherBug Home are making it easy for you to integrate changing weather patterns into your energy management routine. WeatherBug Home’s Mobile App allows you to connect a smart thermostat to their weather monitoring service and will automatically adjust your HVAC system for optimal performance as the weather shifts and seasons change. Additionally, the WeatherBug Home Mobile App allows you to view how various weather conditions may affect your monthly bill. The one product that you have in every room in your home may be using the most electricity. As lightbulbs can go months or years without needing attention, they often go un-noticed. Traditional incandescent lightbulbs use up to 70% more electricity than new LED or compact fluorescent bulbs. There’s are a variety of smart lighting solutions available to fit your needs. Lightbulbs that are connected to an energy management system, your smart phone, or the grid give you total control over your electrical usage. Additionally, your energy provider may offer incentives for replacing old bulbs. For example, Duke Energy is helping their customers improve their efficiency by partnering with local retailers to offer up to 88% off energy efficient lightbulbs. As people return home from work and school, the demand for electricity on the grid grows causing energy providers to have to quickly generate electricity from carbon based sources such as coal and natural gas. By shifting energy intensive activities such as washing and drying clothes, cranking your HVAC system or running the dishwasher to “off peak” hours (typically 4:00 PM -7:00 PM), you are benefiting your entire community. The U.S. Department of Energy’s Appliance Energy Calculator can help you determine which devices and activities in your home are consuming the most electricity. This Earth Day, challenge yourself to shift one energy intensive activity to off peak hours. Learn more about how the Smart Grid is helping America reduce our carbon footprint and the associated benefits of a modern grid.